Mark Davies talks with Michael Abrashoff, a former captain of the the Navy ship USS Benfold. At the start of Mikes tenure as Captain, Benfold was performing pretty near the bottom of the list for the US fleet. In only 18 months at the helm Mike completely changed all that, the crew started to believe in themselves, and with Mikes help they realized it was their ship and if they were to succeed then they had to succeed together or fail together. 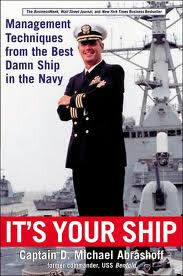 The results Mike and his crew achieved are amazing and are told in Mikes book ‘It’s Your Ship’. In which he explains the approach to Leadership he learned and adopted which can be used in all areas of anyone’s professional life, not just the Military. Join us in this weeks show to find out what you can take away and start using to help your team, your company or yourself today.